As I listen to Pure it moves over a few different guises. It delves into upbeat ambience, possibly similar to David Holmes. The vibe is drenched in stoned beats and throbby bass lines, and it sounds like it is of the sample nature. Pure is a CD that would cater for many moods. You may well listen to it and be attracted to its fresh almost funkish rhythms, as I was, but you may think it is too repetitive, which it is, but that is its purpose? It is in the experimental mould, and it drives home catchy beats and laid back atmospheres easily. I am not quite sure if the songs of this CD match the names on the cover, so I will not mention any. I will say that I like the feel of them all. I would not say there is a bad track on it in my eyes. Maybe it is the fact that I like long repetitive pieces that indulge me in sound creation/improv, and that is exactly what Pure did. I find it very driving in its nature. The tracks flow nice between one another, each chancing glimpses of sampled narrative, mixed with synth indulgent soundscapes. Some tracks are very much in the David Holmes feel, I like the energy behind them, I also liked the rough edge to the whole thing. The production and sound quality is not the best but it really does get you inside the music, which is one reason why I like it so much. It may not be what the purists want but they can f*** off. 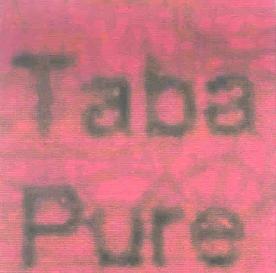 Taba on Pure has created an indulgent album that may sometimes be repetitive, but that is what its about a far as improv goes. The sounds used are spacey and the rhythms vary. It makes use of many ambient styles, and it is up to us to help push that music forward.